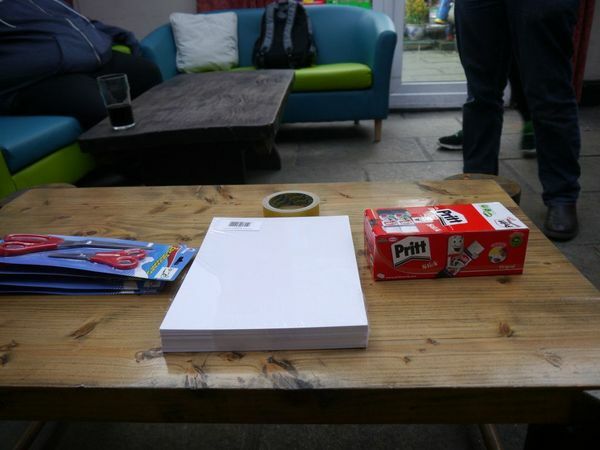 Fantastic – That’s the word I’d use to describe this past GeekOut Bristol Meet. 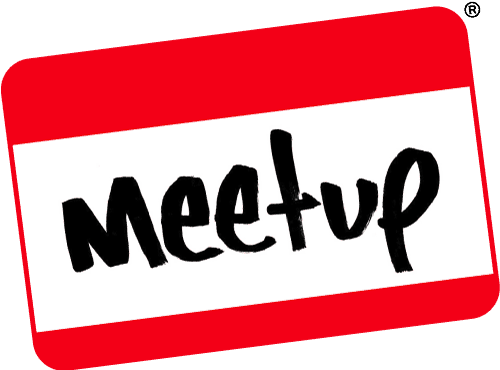 Another month has gone by and another meetup Gallery is here for you. This month however, my camera died! How inconvenient; however help was on the way in the form of Dillon Keith Diep, who came along with his trusty Canon camera! So with the criteria for a gallery sorted, we had a night filled with Fantasy and… Oh god… I made the wrong decision when I decided we needed a Fanfic writing competition. Mordor, Ankh-Morpork, Hogsmede, Eternia and Hyrule. What do all of these places have in common? If you said “They all have vowels”, well you’d be right, but that’s not the answer, silly! No of course, all of these amazing places are Fantasy worlds; places where swords, spells and strange fashion sense are commonplace. 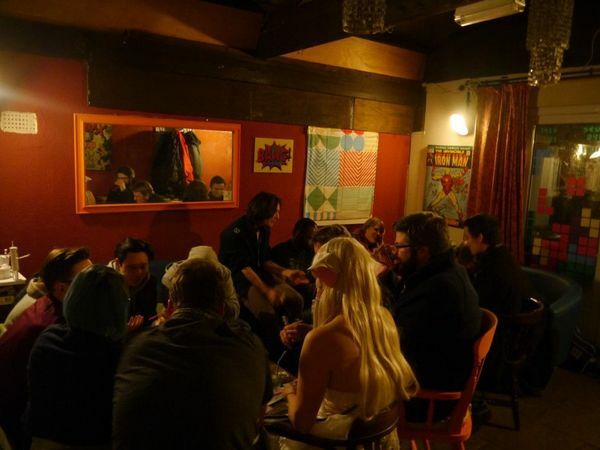 So whether you’re into fashionable tunics, wisened robes, or if you’re more of a platemail wearing warrior, come along to this months fantasy-themed GeekOut Bristol Meet! That’s right, we at GeekOut South-West believe in having a good nomming session before we start the night with fun, games, drinks and great company! Vote either on Facebook, or in the comments below, only if you’re coming to the pre-meetup. Or, you know, we could also be chaotic-evil. Whatever your alignment, this fantasy themed event will leave you enchanted with lots to do and see. 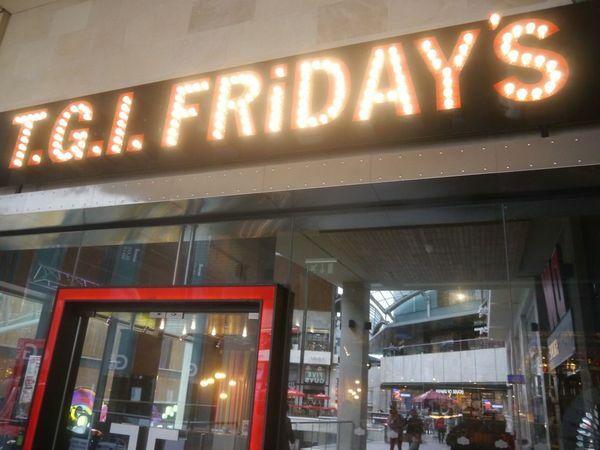 So come along, buy a drink and have a chat with your fellow GeekOut Bristol Meet geeks! Whoever your fantasy fancy is, you should totally come and sport your favourite outfit to have a night of fun and games in cosplay. 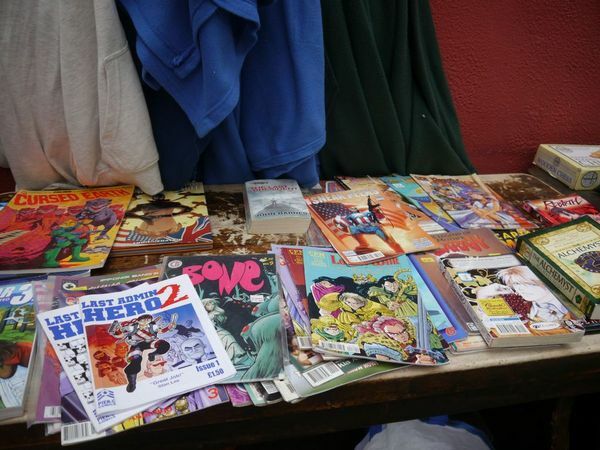 Whether it’s your first time, or if you’re a seasoned veteran of cosplay, come join your fellow Bristol geeks and come show off your amazing outfits! Everyone loves a good free-to-enter competition and this month will be no different. Hoo boy, I might be setting us up for something a bit terrible here. This month marks NaNoWriMo, National Novel Writing Month. With that in mind, we figured we’d let our audience loose on their creativity. With a hard limit of 350 words, a fanfic scenario must be presented and written. Any existing character can be used in any context – be it a normal day for the character, a raunchy outting or otherwise. We obviously will not allow people to mock one another in real life through their prose; nor will we accept racist, sexist, homophobic, disablist, or otherwise derogatory entries – It’s all for a good laugh! As part of our commitment to being a great night out, we do not discriminate based upon age, disability, gender, race, religion or sexuality. If at any point you feel you need to speak to someone about another’s actions, please grab the host (Timlah) and we’ll sort it out! Please note, if you require extra support to attend, please leave a message in the comments below and I’ll get back to you. The problem with an addiction is that it’s hard to admit it – Although let’s be honest, if you’re addicted to video games then you’re probably doing alright! 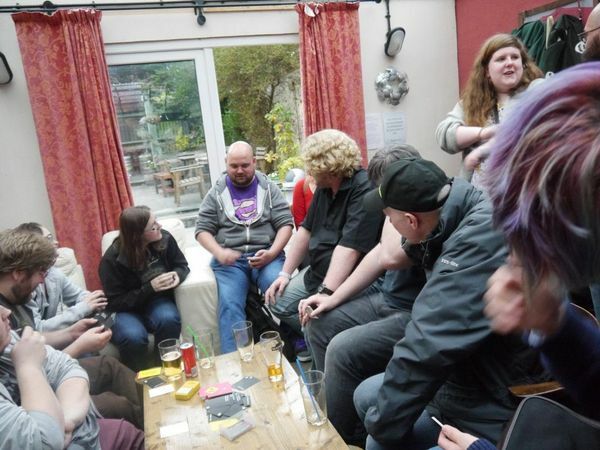 We once again got our behinds to the Old Market Tavern, where we met up for some food and drink, board games and video games, as well as comics and books and so much more. People were chatting all night long and we got a nice number of attendees once more. As always though, we’re here to show you what happened throughout the night and to give you a bit of insider knowledge about next months event. Interested in what we did? Read on! Anime is great, don’t you agree? It doesn’t matter what your tastes are; action, comedy, romance, you name it and anime has covered your favourite genre. They’ve also got genres you’d probably not think about normally, ranging from slice-of-life to magical girls (and boys!) 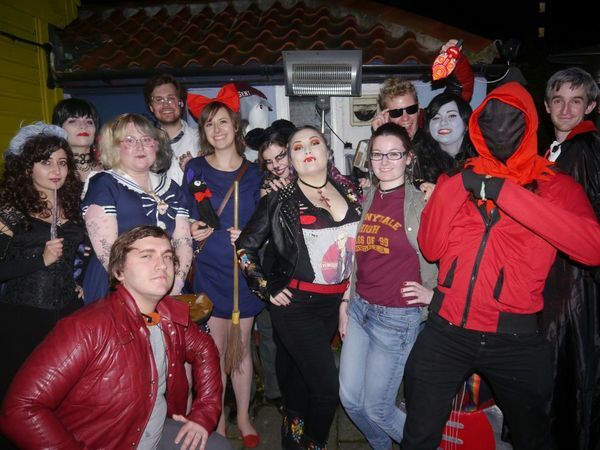 But whatever your tastes in anime, or indeed your tastes in art are, we’ll be hosting another GeekOut Bristol Meet on April 8th, for another great night out filled with geeks and their favourite geekdoms. 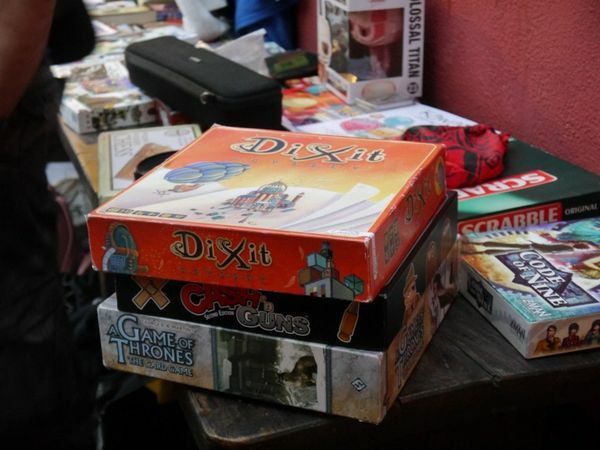 So whether or not you’d call yourself an otaku, a weeaboo, or if you know absolutely nothing about anime, come along and have a look at the fun and games we’ve got planned for our next Bristol meetup. 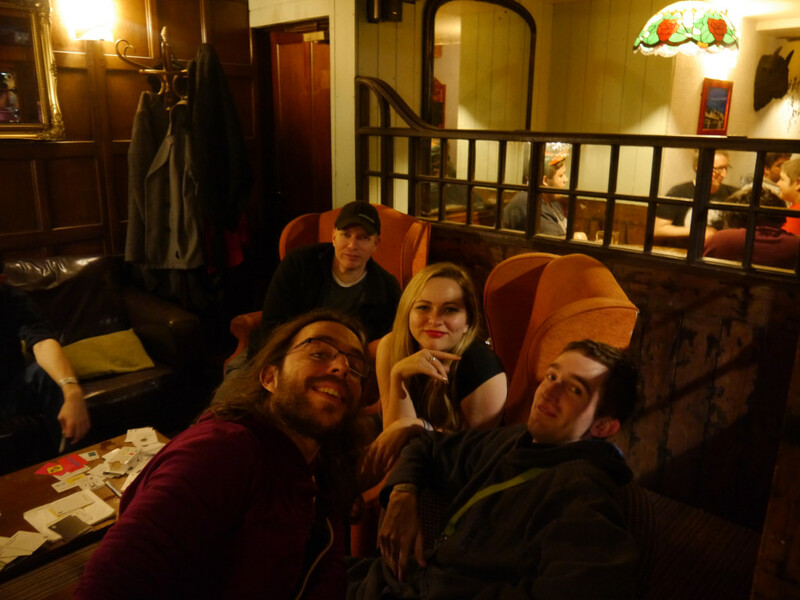 GeekOut Bristol Meet – December 31st: HAPPY NEW YEAR! 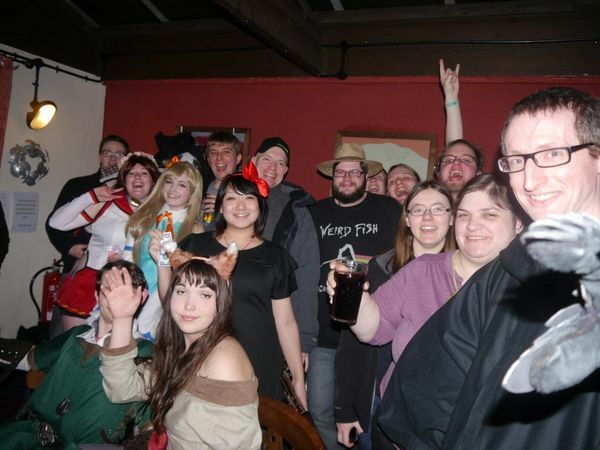 Part of the committment I signed myself up to when I made this website, was to bring events to local geeks. I wanted to do it as much as I could; but time and money is a major issue. Not to mention the fact that venues are typically tricky for special events. However, middle of last year, we moved away from our first venue into the Old Market Tavern – and we’ve had a hell of a time since then. As such, I’m always looking for ways to bring everyone together for a fun time… And there’s one time of year that can be amongst the loneliest for all of us, yet also is a time for celebrating.